Smallest and tamest of the woodpeckers. Six or seven inches long. White chin, throat and underside. Black crown, black and white streaks leading back from the beak across the side of the head and red patch in the back of the male’s head. Black and white back and black wings with white bars. Widespread and abundant. Year around resident throughout the lower 50 states except the arid south west, from lower and coastal Alaska, throughout most of Canada below 60 degrees north latitude, lower Quebec, New Brunswick, Nova Scotia, and Newfoundland. 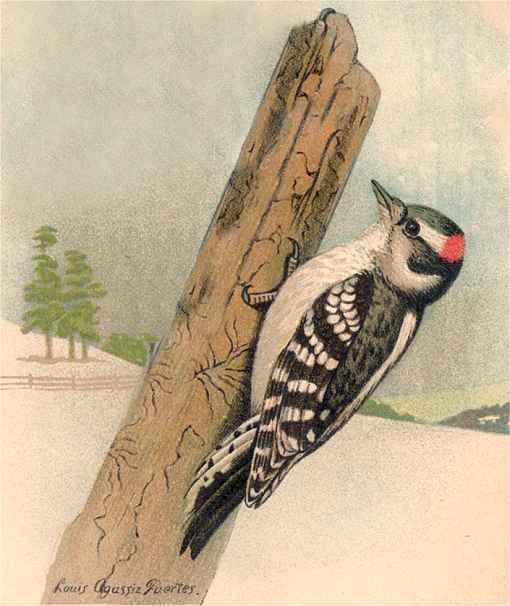 Downy Woodpeckers excavate their own cavities usually in partially decayed trees in deciduous and mixed forests, apple orchards, groves, farms, country homes and towns. They are common most anywhere there are trees, even suburbs and cities and may be attracted to correctly sized and well placed birdhouses. Lays three to five, more or less, white eggs. Young hatch after less than two weeks incubation and leave the nest in about another three weeks. Forages for insects, berries and seeds on the branches of low trees, hedges, and brush heaps. Visits feeders and likes suet in cold winters. 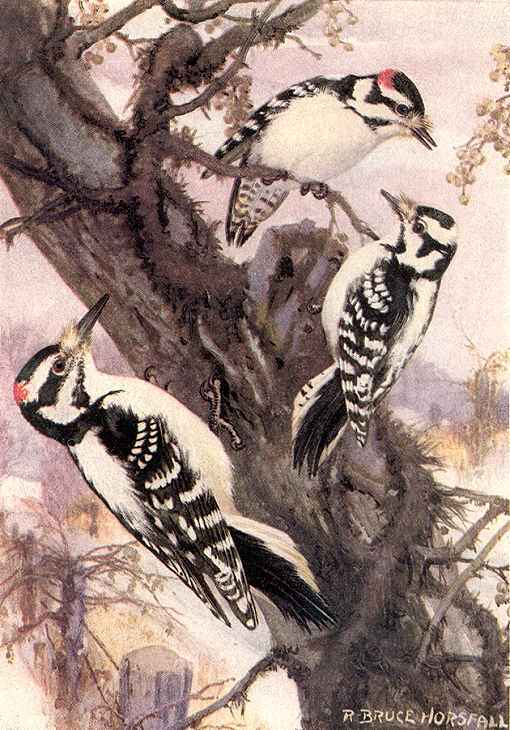 Typical short drum rolls heard in woodpecker country are often downy and other woodpeckers testing wood conditions, possibly signaling, maybe even on the side of your house early in the morning. Occasionally emits a call resembling the metallic ring of a hammer contacting a chisel. They are social birds, often seen foraging in the company of other species including chickadees, nuthatches, titmice and wrens. The downy woodpecker birdhouse (same as for some of the chickadees, titmice and nuthatches), has a 4″ by 4″ floor, 9″ inside ceiling, 1 1/4″ diameter entrance hole located 7″ above the floor and ventilation openings. Assemble with corrosion resistant screws fit to pre-drilled countersunk pilot holes. Secure hinged roof with shutter hooks for easy access and safety when maintaining at heights. Mount nest box on a tree trunk about eye level or just out of reach, higher if necessary. Place few wood chips, not sawdust, on the nest box floor. Mounting birdhouses obviously becomes more dangerous as heights increase, even more so because it’s awkward. There are millions of experienced pros – carpenters, roofers, linemen… Have them do these things. Smallest and tamest of the woodpeckers. Six or seven inches long. White chin, throat and underside. Black crown, black and white streaks leading back from the beak across the side of the head and red patch in the back of the male’s head. Black and white back and black wings with white bars. The downy woodpecker birdhouse (same as for some of the chickadees, titmice and nuthatches), has a 4″ by 4″ floor, 9″ inside ceiling, 1 1/4″ diameter entrance hole located 7″ above the floor and ventilation openings. Assemble with corrosion resistant screws fit to pre-drilled countersunk pilot holes. Secure hinged roof with shutter hooks for easy access and safety when maintaining at heights. Mount nest box on a tree trunk about eye level or just out of reach, higher if necessary. Place a few wood chips, not sawdust, on the nest box floor. Remove the nest from the box following the brood rearing season. Chickadees, nuthatches and titmice may use this box. Mounting birdhouses obviously becomes dangerous as heights increase, even more so because it’s awkward. There are millions of experienced pros – carpenters, roofers, linemen… Have them do these things.